Audiobooks are great for us when we find ourselves with moments where we're awake, but have other things to do with our hands. Listening to audiobook is a great way to multitask during those times of day and add a little culture to us. Where do you get those audiobooks? From Audible.com? Since it is the biggest seller of spoken audio entertainment, information, and educational programming and owns the largest amount of digital audiobooks, including AA and AAX formats. But you should also be aware that the AA or AAX audiobooks are protected by Audible's DRM policy, which prevents you from transferring the audiobooks to other devices, though you are the owner of those audiobooks. So is there any way to get the DRM off from the AA audiobooks and convert them to regular formats, like MP3, AAC or WAV? Well, yes, there are indeed such kind of software, usually called Audible Audiobook Converter or AA DRM remover, that can help you to remove Audible DRM protection and convert AA audiobook to plain MP3, AAC or other audio formats. 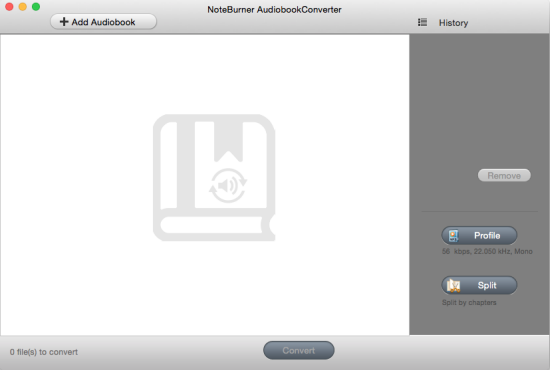 Here you can get NoteBurner Audiobook Converter, one of the best audiobook DRM removal tool for Mac OS. With this audiobook converter, you can easily strip DRM from Audible AA audiobooks and convert them to MP3 quickly. After that, you are able to sync those audiobooks to any of your media player, like iPod, Zune, etc. 1. 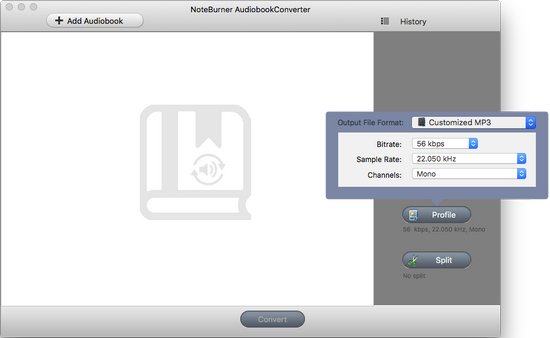 Launch NoteBurner DRM AA Converter and click "Add" button to import the Audible audiobooks into the converter. 2. Click "Profile" button to set the output format as MP3. 3. You can start to convert the DRM AA audiobook to MP3 by clicking "Convert" button. Wait for a while and you will get non-DRM protected audiobooks in MP3 format to play on any media player. You can also simply watch video demo here: Video Tutorial of Converting Audiobook on Mac. 1. Once the conversion is completed, you can split the audiobooks into different parts with the splitting feature. 2. To keep the chapters of the audiobooks, you should set the output format as AAC. What's next? Download NoteBurner Audiobook Converter now!